This Thanksgiving, invite your friends and family over for a turkey feast prepared by Executive Chef Serge Belair and his team of 11 Red Seal chefs. Pre-order your feast before October 2nd at 4:00 p.m. for only $177*! 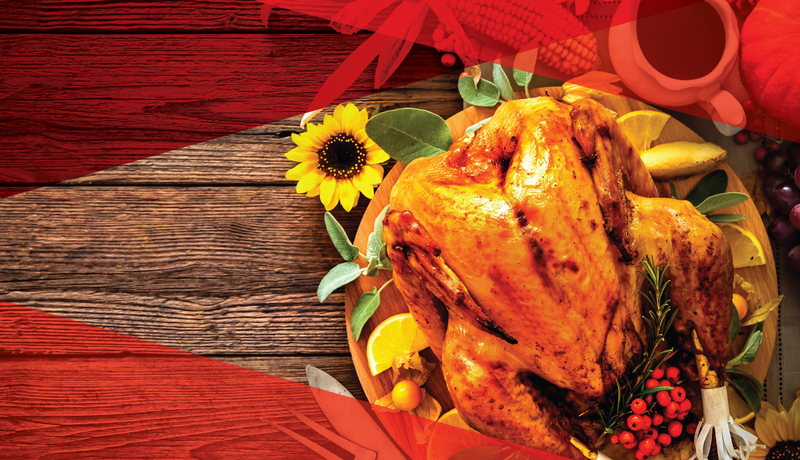 You’ll receive one fully-cooked 14-pound turkey, including three delicious sides of homemade turkey gravy, sweet turkey stuffing and the Edmonton Convention Centre’s signature cranberry sauce. Additional sides are $11* each and 5% of proceeds from each turkey dinner purchased will go to Edmonton’s Food Bank. Each side serves 10-12 people. Thanksgiving feasts ordered after the October 2nd early bird deadline will be $225*, with final sales closing on October 4th at 4:00 p.m.
Sunday, October 8 from 11:00 a.m. – 4:00 p.m.
Monday, October 9 from 2:00 p.m. – 6:00 p.m.
*Price does not include taxes and fees. Includes 18% gratuity. *For pickup only during specified times. Early bird pricing only available until October 2nd at 4:00 p.m. Final sales close on October 4 at 4:00 p.m.
Turkey is gluten and dairy free with gluten free gravy. Please contact Annia Motes at 780.969.0409 or amotes@edmonton.com with any inquiries.